Shares of Bunge Limited had a great run last month. Here's what you need to know. What: Shares of agribusiness and food company Bunge Limited (NYSE:BG) rose 14% in March after shares recovered from levels last seen in Spring 2010. The global commodities squeeze has been a common headwind for many companies tied to volatile markets in the first quarter of 2016, and Bunge Limited is no exception. 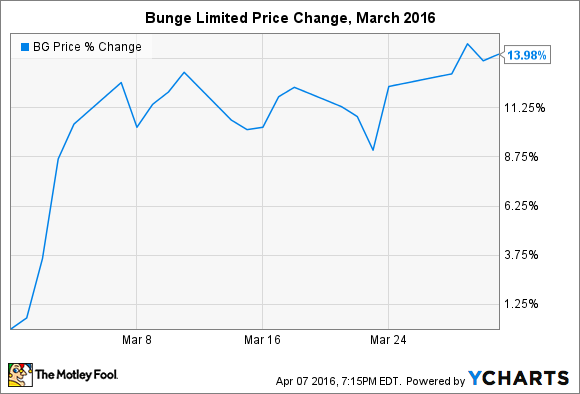 So what: The turnaround in the stock price began when Bunge Limited announced full-year 2015 results in mid-February. For the annual year-over-year comparisons, total revenue was down 24%, but total segment EBIT was up slightly, while adjusted EPS posted an 18% improvement. An outsized portion of that occurred in the fourth quarter of last year, which signaled to investors that the commodity markets may not be crumbling before us after all. Better yet, management expects growth across all segments in 2016. It's also worth noting that CEO Soren Schroder has made high-value business diversification a key priority in recent years by making strategic acquisitions in flavors and fragrances, high-growth food ingredients, and other industries to protect Bunge against volatility in commodities markets. While it's still very early in that strategy, the initial signs point to it working. Now what: Bunge Limited remains an important company in the global agribusiness landscape, with major operations spread across the world's breadbaskets in the United States, South America, and Europe. Volatile markets are out of the company's control, but putting more focus on high-value industries and product portfolios should help investors weather future rough patches more easily.